Are you like me and like to add a little whimsy to your outdoor living space? I hang mirrors and signs on the fence and collect garden angels for the flower beds. I needed something in the backyard to drown out the annoying traffic pollution noise from the busy road behind our house. I love the relaxing sound of wind chimes and how each one sounds different. I've had a lovely melodic set I believe called Corinthian Bells for many years in one corner of the yard. 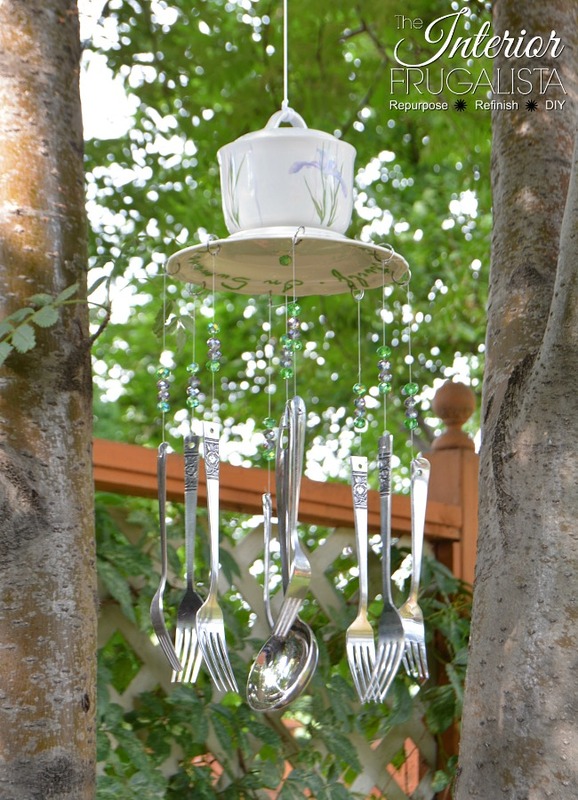 It was time to add another tone to the mix with these DIY Whimsical Silverware Wind Chimes made with thrift store finds. I found everything I needed to make the windchimes during one trip to Goodwill. 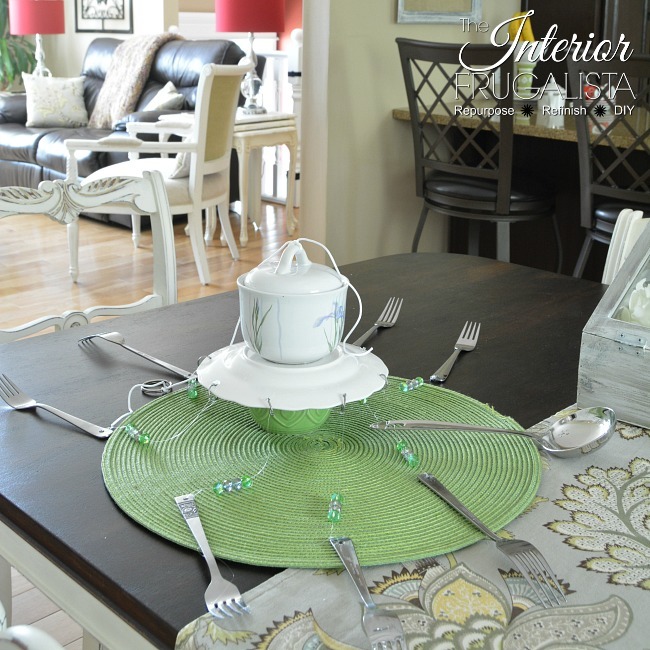 Sugar bowls, teapots or any dish with a handle on the lid work perfect for this project. You'll also need around eight pieces of silverware and a larger ladle or serving spoon for the centre. I have to admit, my DIY wind chime project didn't come without some hiccups and I'll share more about those throughout this post. Before I get into the deets on How To Make Whimsical Silverware Wind Chimes, let me tell you why I used these particular accouterments. 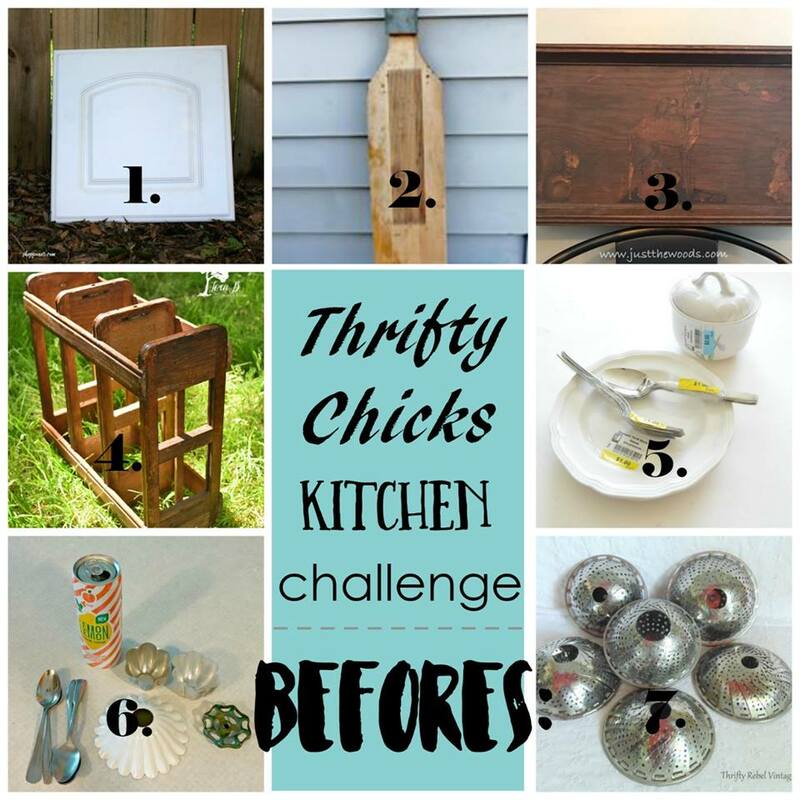 I'm so excited to be participating in the second installment of Thrifty Chicks. In case you missed our first challenge, on the second Wednesday of every month a few of my creative junk loving friends and I come together to transform, upcycle or repurpose a junk find based on a theme. This month the theme is Kitchen and our task is to upcycle something either found in or to be used in a kitchen. If you missed our Chair Challenge in June you can catch it here in my post, Scandinavian Half Painted Chairs. If you've been following me for any length of time you know that I like to add an element of surprise to my pieces. For my wind chimes, I decided to add a quote around the rim of the plate. Such a fitting quote for a wind chime, don't you think? Now let's get into the meat and potatoes of how I made my silverware wind chimes. 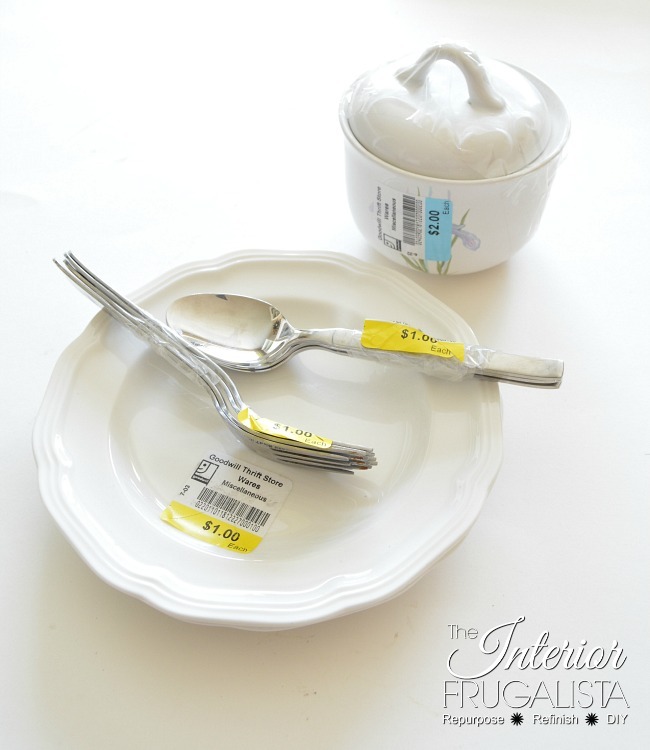 These are the kitchen items I found at Goodwill, minus the spoons and plus some salad forks - we'll talk more about that later. 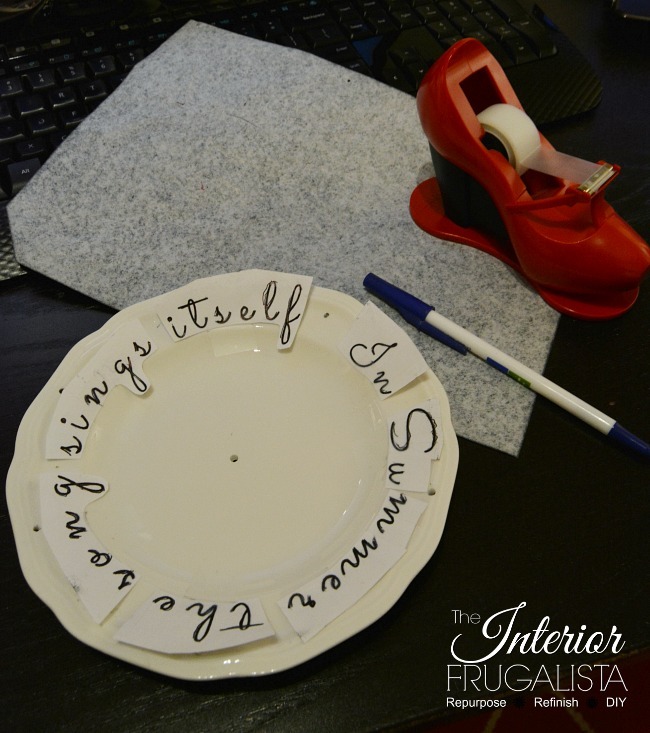 Let's start with the easiest step, gluing the lid onto the Corelle Coordinates Shadow Iris Sugar Bowl with E6000 Glue. Set it aside for at least 12 hours before handling it by the lid. I thought the graceful white Mikasa French Countryside Salad Plate would be such a pretty base for the sugar bowl. I quickly learned there was nothing graceful about this super strong stoneware. When trying to drill holes for the jewelry thread we went through three...let me repeat...three 6 mm Diamond Core Dremel Bits and about 10-minutes of sweat equity PER hole. Determination is my middle name and so an hour or so later the dang nine holes were finally drilled. TIP: I recommend you DO NOT use stoneware or heavy porcelain dishes. 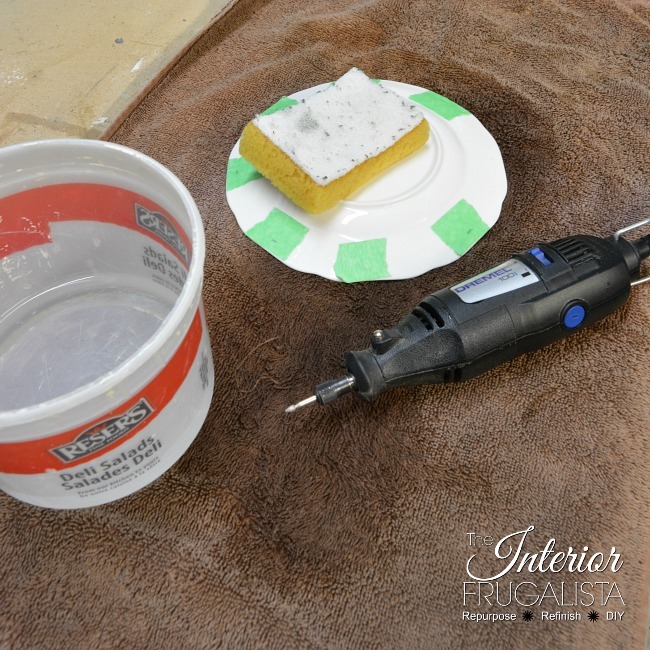 Look for Bone China or Fine Porcelain if you plan on drilling holes. Make sure you wear safety glasses and protective gloves both when drilling holes in the plate and the silverware. We want you to finish this project and not wind up on an emergency room gurney. It's important the plate be cooled during the drilling process so you will require a bucket of water and a saturated sponge. Be VERY careful when using an electric power tool near water. You DO NOT want that bucket of water spilling. I suggest you have the pail of water in a separate area nearby and put the drill down before dipping the sponge into the water. 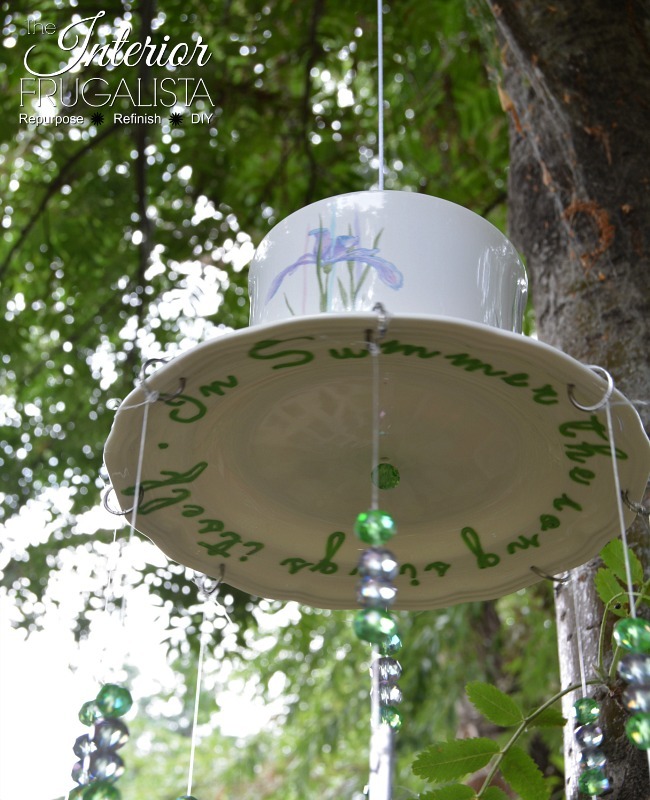 Flip the plate upside down (we want the good side of the plate to be seen when hanging high above in a tree). With a marker place a dot in the centre of the plate followed by 8 dots evenly around the plate about 1/4-inch from the edge. Place a piece of tape over each dot (masking tape works better), this will give the bit some friction and stop it from sliding across the smooth porcelain finish. Use a 6 mm Diamond Core Dremel bit. If you don't have a Dremel you can use a Power Drill and 6 mm Diamond Core Drill Bit. Start by angling the bit to pierce through the tape and start the hole. Once the hole is started, drill straight down into the plate. Make sure you are squeezing a water-filled sponge over the hole to keep the plate from overheating and shattering. In the photo at the top of this post, you saw that I had a bundle each of dinner forks and spoons. Well like the salad plate, the spoons were tough as nails and no matter what bit we tried nothing was piercing into those spoons. So we ditched the spoons and got a bundle of salad forks along with a large salad spoon for the centre. 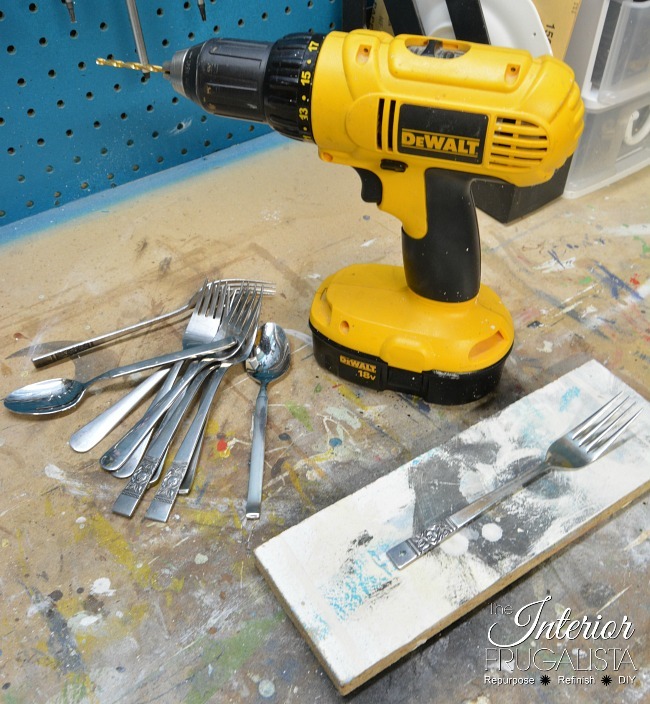 TIP: Use Sterling silverware rather than stainless as it is much softer to drill through. Important: Again you want to wear safety glasses and protective gloves for this step. Those fine shards of metal are nasty. Using a 3/16" High-Speed Metal Titanium Drill Bit, Drill a hole into the top of each fork. Be forewarned, the silverware and drill bit will get VERY hot. In PicMonkey (or software of your choice) type the quote and use the curve text option to create the graphic and size it to the diameter of the plate. 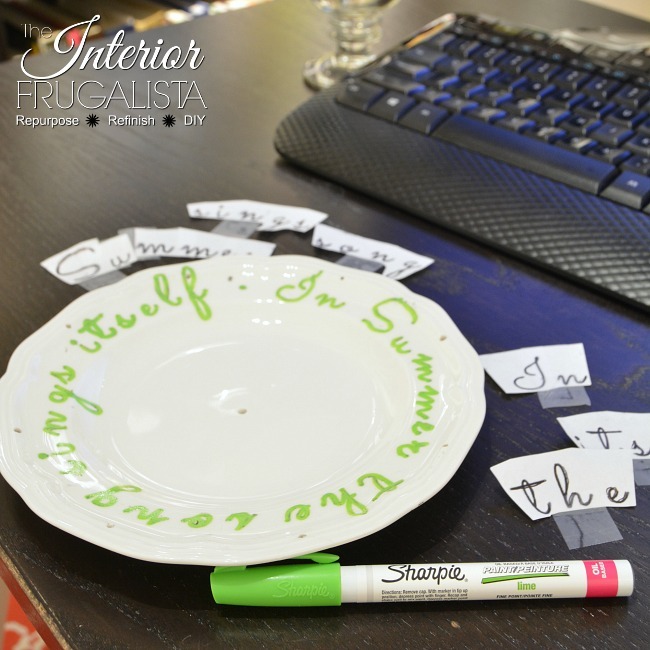 Print the graphics and cut each word (if they don't line up perfectly as a whole) and tape them onto the plate (as pictured below). Next, slip a piece of carbon or graphite paper behind the words and trace them with a pen so they transfer onto the plate. Using a fine tip Sharpie Oil-Based Paint Pen in the color Lime, go over each letter twice, allowing the ink to dry between coats. Tie clear jewelry thread (or fishing line) into the holes of the silverware, cutting the strands longer than necessary (approximately 12-14 inches). String a green bead about 1-inch from the top of the silverware and double looped through the bead to secure in place. String two purple beads (no need to double loop). String a green bead and double looped through the bead to secure in place. Set the plate on top of a bowl to raise it off the table. Using needle nose pliers attach the silver jump rings through each hole and squeeze the ends tightly closed. On the large salad spoon strand ONLY, string a green bead about 2 1/2-inches above the lower beads and double looped through the bead to secure in place. String the thread through the centre hole on the plate and tie the thread into a knot about four times onto a paper clip. Add a dollop of glue to the plate and press the paper clip into the glue to secure it in place. Cut off the excess clear thread. Next, tie the dinner forks onto every second jump ring with about a 2-inch strand of thread from the last bead. Tie it in about four knots and cut off the excess thread. Repeat the same step for the salad forks except leave about a 4-inch strand of thread from the last bead. The key is to have all the fork tines hit each other and the large salad spoon in the centre when the wind blows. 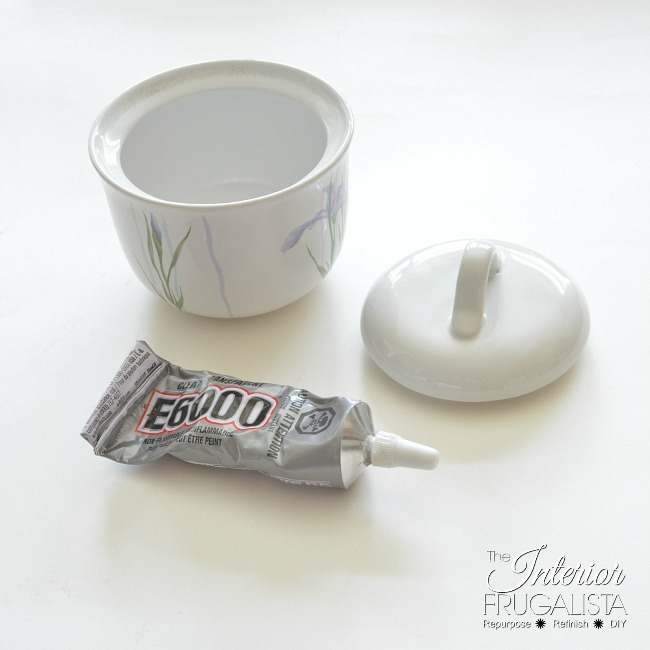 Glue the sugar bowl onto the plate using E6000 Glue (as pictured above) and leave it overnight to cure. Avoid tugging the sugar bowl during the next step. Attach a piece of white 1.5 mm 100% Nylon Cording to the sugar bowl handle. I think I used what's called a square knot or granny knot but I'm not 100% certain because I was never in Girl Guides nor did I know what I was doing when I tied the knot. You may want to do a Google search for this step. Loop the other end of the cording through a key ring using the same knot (I couldn't tell you how I managed to make the same knot twice). Leave about a 10-11 inch strand and cut off the excess cording on each end. 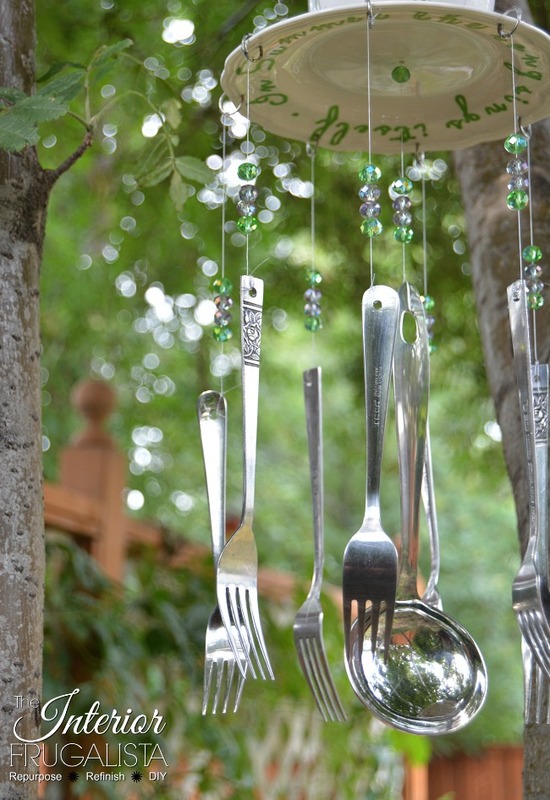 That my friends are How To Make Wind Chimes From Thrift Store Dishes and Silverware to add some whimsy to your outdoor living space. Told you it was a "short" video and tiny too. 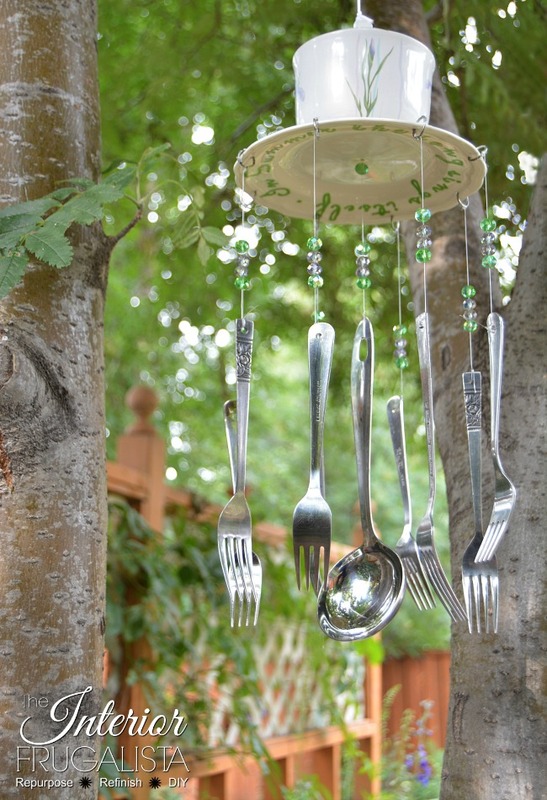 If you like my DIY Silverware Wind Chimes please share them with a friend and/or save it on Pinterest. You can see another set of whimsical wind chimes that I made for my daughter-in-law here in the post, Whimsical Teapot Wind Chimes. Please join me in visiting my friends to see what they did with the items pictured below. I'm very intrigued by some of these interesting objects. Thanks Virginia, they were fun to make! I absolutely love this idea! I'll be giving this a try soon for my new house. Thank you for sharing! So glad to hear you'll be making one of these windchimes for your new home. Have fun making yours! It's adorable! Thank you for sharing the tutorial! I too love thrift shopping and garden junk as I like to call it! Thank you very much! Isn't it so much fun to repurpose hrift store treasures into fun and whimsical garden junk? Already planning this summer's junk'n projects! This is the prettiest wind chime. You never disappoint with your re loves of things. Have a great week leading up to Easter.